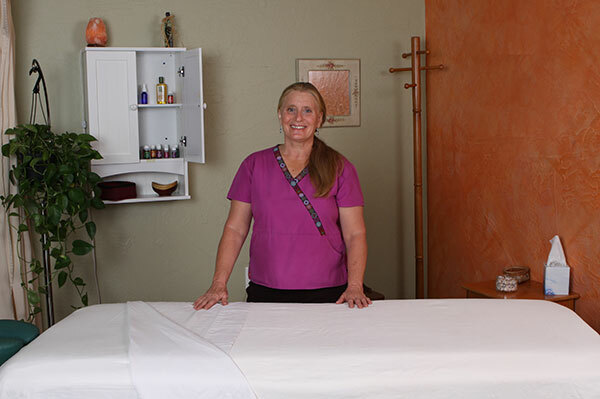 Therapeutic Massage, Reflexology, and Craniosacral Therapy serving the areas of Safford, Arizona and the Gila Valley. Whether you just need a day of rejuvenation from everyday stresses or have a specific problem or pain that can be relieved with massage, Kathie will have you feeling better. The reduced stress as a result of massage gives you more energy and has been shown to reduce your chances of becoming ill or injured. The emotional component of massage therapy should also be considered. Always feeling tense, uncomfortable, or in pain affects how we view ourselves and others. Relieving those stresses through massage therapy can often be life changing. The health benefits of massage therapy can be both relaxing and energizing. The act of simply relieving muscle tension can improve your day and add to the enjoyment of your activities – whether work or play. Massage therapy improves posture, circulation, and flexibility, lowers blood pressure, and can relieve headaches. It can even relieve symptoms caused by asthma and help decrease bouts of insomnia. Your first visit will include being asked about your general health and any problems you are hoping massage therapy will be able to resolve. Once you are a client, applying varying types of pressure (light, firm, deep) during your massage will depend on what issues you are having and where. Addressing all your concerns is an important part of the communication that needs to occur between therapist and patient, so be sure to let your licensed massage therapist know what feels good and what doesn’t. Call 928.428.3307 to book an appointment. Copyright © 2019 Kathie Holmes, LMT. All Rights Reserved.